The Federal Government is composed of the Federal Chancellor and the Federal Ministers. Together they make up the Federal Cabinet (Article 62 of the Basic Law). 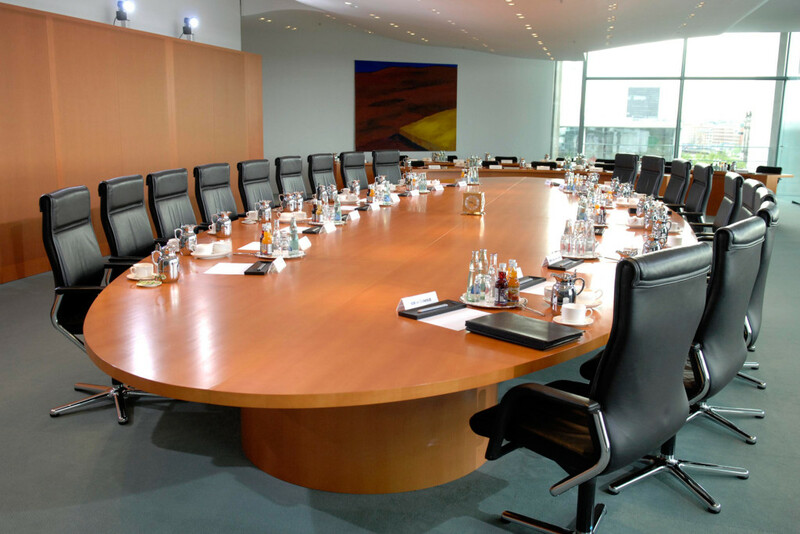 The Federal Cabinet is chaired by the Chancellor. The Federal Chancellor chooses the Federal Ministers and the departments for which they are to be responsible. She submits a binding proposal to the Federal President on the basis of which he appoints or dismisses the Ministers. When there is a coalition government, the Federal Chancellor is bound politically by coalition agreements. Negotiations on coalition agreements generally precede the forming of the Cabinet. During these negotiations the coalition partners reach agreement on the government’s programme. A coalition government is formed when two or more parties that are represented in the Bundestag and together hold the majority of the seats in the Bundestag form an alliance. The federal government is then a coalition government. The Basic Law does not stipulate the precise number of Federal Ministers. The Cabinet may have to be reshuffled during a Federal Government’s ongoing term of office if ministerial offices are reallocated. The Cabinet has an important role to play in day-to-day government. It meets every Wednesday and is chaired by the Chancellor. Whenever the Chancellor is unable to attend, her deputy chairs the Cabinet meetings. During Cabinet meetings the Chancellor and the members of the Cabinet discuss and decide on the Federal Government’s upcoming projects: draft laws, ordinances, initiatives, programmes of action, reports and the federal budget, for instance. The Cabinet has a quorum, i.e. can take decisions that are valid, when half of the Federal Ministers (including the Federal Chancellor or her deputy) are present. The Basic Law distinguishes between three important principles that apply to the work of the Federal Government: the principle of Chancellor policy guidelines, the principle of collegiate responsibility and the principle of ministerial autonomy. They dictate how the Cabinet works and the division of labour within the Cabinet. According to the principle of Chancellor policy guidelines, the Chancellor determines the general guidelines of policy and has responsibility for them. That means that she conducts the business of the Federal Government based on the rules of procedure adopted by the Cabinet and approved by the Federal President. The principle of collegiate responsibility says that the Chancellor and the Ministers make joint decisions on matters of a general political nature. Whenever there are differences of opinion, the Chancellor is the “first among equals”, however. Thus, when there are differences of opinion between Ministers, the Chancellor has to mediate. The Cabinet must decide by majority vote. Under the principle of ministerial autonomy each Federal Minister is responsible for his or her department . For example, the Chancellor cannot “interfere” with the powers accorded to her Ministers. At the same time, each Minister must ensure that decisions taken in his or her department are in line with the policy framework determined by the Chancellor. Federal Ministers can, however, enhance their standing in other ways: through their own achievements, knowing how to present themselves to the public, or strong backing from parliamentary or non-parliamentary forces.